ST Board grants final approval on the contract to build the Link segment between Westlake and Capitol Hill, 12% below budget estimates. In the same article: ST’s legislative priorities (pdf) for 2010. Tacoma City Council unanimously votes to proceed with the Sounder D-to-M segment, berm and all; ST releases new sketches of the Sounder Pacific Avenue bridge, trying to meet community demands. Now Lakewood is grumbling about running trains through town. The City of Seattle makes the case (pdf) for service cuts targeted at low-productivity routes. 550 broken down at Westlake, suspends tunnel service for 40 minutes. I’m not sure that “support of an on-budget streetcar line” on First Hill is really a change in Mallahan’s position. Kirkland Transit Center breaks ground. The last few “PT Tomorrow” workshops happening over the next few weeks. More Transit Oriented Development at Othello. Redmond bribing people to drive less. A dissenting view on the East Link Open Houses. Our coverage here. A fashion shoot on Link. Does anyone know if that other TOD project at Othello, (It’s called Othello Station North, right?) will break ground soon, like the project just to the south of it? Already, Othello Station seems like it has the most riders of any Valley stop to me, and it looks like, with all this development, it’s poised to become the major urban village/center of SE Seattle. I think the other project is on hold for now – when I talked to the developers at the opening day open house, it sounded like they needed the income from the first project first. I had a fight about the dangers of the Bypass plan with Ben a few months ago. The people of Tillicum/Lakewood are not being stupid about this. There is very little room between the freeway and the railroad crossing at two of these crossings. Traffic backs up today because of jams on the I-5 bridges at the lights and Amtrak will come blasting through at 79 and up. There is even talk of double tracking and 110 mile and hour speeds within a few years. If they install the expected four-quadrant gates occasionally cars will be trapped when the gates come down. People will be killed spectacularly at these crossings. You can expect the TV stations to be competing for the bloodiest nickname for the corridor. The state will eventually have to re-engineer all six of the I-5 interchanges to accommodate grade separation. It’s disingenuous of WSDOT not to admit these additional costs. There is a way to solve this problem. Four-quad gates on the North East Corridor (yes, 110+ mph and grade crossings) have sensors that keep the exit gates open until all cars are out and alerts the train’s engineer that there’s still a car in the gates. They cost about a million extra per crossing. 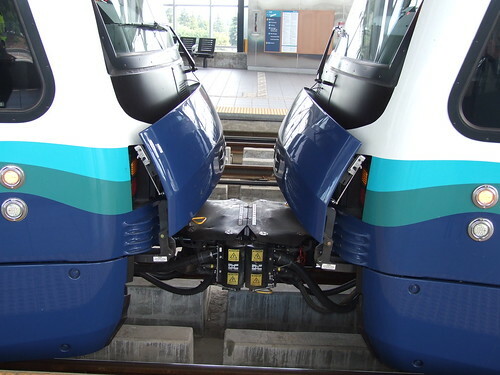 If WSDOT decides to install Positive Train Control (which is required for trains traveling above 80mph), then the train could/would be forced into emergency if they got too close and a car was still in the grade crossing. Yes, it takes a while for a freight train to stop, but those little Talgos can stop pretty well. Or maybe people can get a f****** clue and not stop on the tracks. Or turn into the side of an LRV. Or walk along railroad tracks. We can only mollycoddle the highway addicts and spend money supporting their addiction for so long (and it has been a century+ now). Traffic jams backinbg out onto on the “free”way? Too bad! Get on a train! The N/S BNSF mainline has plenty of grade crossings. Some of them are in places with plenty of traffic congestion yet there are few car/train collisions at these crossings as people know better than to stop on the tracks. In the short term big signs warning people not to stop on the tracks and possibly moving the traffic signals might be enough. Long term much like the busier crossings in the Kent Valley and in SODO, grade separation will be the way to go. These are all generally good points but not really applicable. Does the BNSF ROW through the Green River Valley have any crossing at which there is a traffic light a few feet from each side of the tracks, except close to the stations at Kent and Auburn where the trains are slowing to stop or accelerating away from a stop? At 37th and B in Auburn B Street is right alongside the tracks, so there is the possibility that an eastbound car might be trapped in the crossing, but at least there are two tracks, so unless the driver is extremely unlucky and a train comes from each direction, one or the other of the tracks would offer a refuge. That is also true of the NEC; at all points there are two or even more tracks between the gates, offering a refuge unless trains meet at the crossing. Grant that likely happens fairly frequently on the NEC with its very high volumes. That will be true of the Bypass as well once double tracking is completed. Perhaps the DOT will place the gates where they would be if two tracks were present, offering a refuge within the gated area. I certainly hope they put the escape sensors in, but it doesn’t matter if the gate is open if there are cars stopped in a traffic jam directly in front of a trapped car on a single track. No, it won’t happen often, but it’s foolish to suppose that it will never occur. And when it does luck will have it that there is someone with a cell-phone video of a van with a mom and three kids in it flying through the air for several hundred feet. Cascades trains are not slowing to stop or accelerating away from a stop in Kent or Auburn. Only Sounder stops at those stations. This is why your argument doesn’t hold water. The existing crossings have lots more traffic than the crossings at the bypass. Please stop drumming up fear. It’s very likely that a thousand new train trips every day will reduce accidents far more than these crossings would add. The ONLY incident involving the Acela Express at a grade crossing is no where near a station where the Acela Express stops. I think you’re just pulling facts out of your rear. OK. You guys win. If a catastrophic accident ever happens, I hope you remember this discussion. If it was up to me we’d immediately condemn the viaduct and start tearing it down as soon as possible. Once that is done we can worry about how to replace the thing. oops, I thought I was replying to something else in another thread. As for the grade crossings I think the problem can be managed, though it make take some people getting a Darwin award before the lesson of not stopping on train tracks sinks in with the public at large. Also having the police give out huge tickets for a couple of months prior to service starting might get the point across as well. You all know way too much about Lakewood! Anandakos, it just seems pointless to worry about a car every couple of years compared to even the fatalities prevented by the trips taken out of cars. You can always grade separate it later if there’s a problem – in the meantime, you’re probably saving people from nasty highway accidents. Of course you’re right about the many accidents saved by people taking the train. But accidents saved don’t make the news. It’d be a great thing if the news would report on things like that. I’m worried about the effect of a car being impaled on an Amtrak going 79 through what is a fringe urban area. The news media will froth at the mouth over that. Ah, so you’re being sensationalist in order to avoid future sensationalism? Give me a break. By my count there are 6 ‘close coupled’ train/intersection crossings at grade along that 7.5 mile section of track through Lakewood, and a couple of over crossings in place. Minor streets could be closed and eventually grade seperated crossings added as train speeds are increased for the others. That’s pretty good, compared to say Jackson to Spokane St.
An interesting alternative (longer term) is to route Amtrak through Ft. Lewis, connecting back with the BNSF south of Tumwater on existing tracks/old ROW (or just continue down to Centrilia). It’s not like passengers are jumping off the train to breach security in a military facility. A stop closer to Olympia/Tumwater becomes possible nearer I-5 than the Lacey station, and foregoes the ongoing tug-of-war with the BNSF- or at least in that stretch. Eventually, we’re going to want 220 mph grade seperated corridors, so it’s time to start looking waaaay down the road. Anandakos, which crossings exactly back up over the tracks? Berkeley St. seems simple – there’s already a light at the offramp, just time it not to allow cars through when Railroad Ave’s light is red. Where else do you see a potential problem here? This seems like such a non-issue. It’s not the cars exiting the freeway and turning right that are the problem. Close the gate and they just back up down the off ramp. Unpretty, but safe. It’s the ones driving south approaching the freeway which can be trapped in the single lane crossing by the light at the north side off ramp or by a sufficiently long queue of left turners from the other side of the freeway. Sure there are technical things that can be done: at a minimum one would expect that when the gates start to flash all directions of the lights at the off-ramp intersections between the tracks and the freeway would go red for every direction except southbound to allow the cars maximum opportunity to clear the crossing. Those to the north would to the opposite: northbound cars would have a green light with red in all other directions for say thirty seconds after the gates are activated so that any queue in the northbound lane can clear. After that it would make sense to have the east-west street have a green. But there will inevitably be some time when that van with a mom and three kids will stall or be trapped in a crossing queue by some event ahead of her. The overcrossings except for Gravelly Lake which overpasses the railroad need to be raised high enough to overpass the rail tracks before the higher speeds you want are implemented. The tracks should probably be depressed a few feet when the rebuild of the existing track happens, too. The undercrossing at the main Fort Lewis gate should be extended northward to underpass the rail track(s) as well, and it should be elevated slightly through that section to make the undercrossing more like that of the freeway. The at-grade crossings in Lakewood farther from the freeway can probably be properly protected by gates, but speeds should certainly not exceed 70 through the city. Why don’t you answer my question about a specific crossing, instead of just trying to create fear? Sorry your imagery, soccer mom et al, is so over the top I can’t even find it in me to take you seriously. Like snake bites I’m willing to posit that most cars struck by trains we not acting legally. Further I think Ben and others have spent more time discussing your “concerns” then they warrant. Everything you’re trolling on about can be addressed with technology that is currently deployed on tracks around the world. From the Pt. Def. bypass article. We’ve all heard that one before. Its NIMBY/anti-train. These people generally have no concept of Opportunity Cost, either. Some of the comments showed some basic ignorance of passenger vs. freight trains. Sure a slow mile-long freight will block the crossing for several minutes but even the Coast Starlight is fairly short and moves fairly quickly by comparison (the Talgos are even shorter and faster). There won’t be a problem with passenger trains cutting off police, fire, and ambulance access. The big thing will just be re-educating drivers not to stop on the tracks. It can’t be too hard as there haven’t been too many problems with car/train collisions at Royal Brougham or Lander which both have much more train traffic. Instead of picking at a comparison to Royal Brougham or Lander, why don’t you look at crossings with nearby intersections in Kent or Auburn, where there also haven’t been serious problems? Why are you treating this any differently? And exactly which crossings are you worried about? I see exactly *one* place with a potential backup problem, and a simple light timing would fix it. Steilacoom Road in Steilacoom has the same problem: lights on both sides of the track. Grant that the northside intersection is farther away from the tracks than at Berkeley. Thorne Lane doesn’t have a northside light, so there is no problem with being trapped that direction, but it does have the same issue going south: it is entirely possible that someone who stops in a queue waiting to go north on I-5 could be stuck there because of a traffic jam all the way across the bridge from left-turners unable to go ahead onto the freeway. I will agree that only these three intersections would need treatment, not all six. Gravelly Road already overcrosses the railroad, as does Pacific Highway right next to it. The main gate at Fort Lewis has no stop lights either north or south of the crossing, and Bridgeport Way has Pacific Highway between the rail crossing and freeway and no signal nearby to the north. And I did write about 37th and B in Auburn, which is the only even nearly analogous crossing in the Valley. It has a light only on one side and it’s very hard to believe that there would be a giant backup of left-turners waiting to get on B Street. All of the other crossings north of Sumner are in downtown Kent or Auburn. The important arterials that cross the BNSF are already grade separated everywhere else. There are three in Sumner and a couple in Puyallup which should never be crossed by any train at a speed higher than 70. Thorne Lane’s southbound stop line is before the tracks. There’s no reason for them to stop on the tracks. Steilacoom Road has extra stop lines in the northbound direction before the train tracks. Simply put: When the Wilmington Drive light is red, make the light at the offramp red as well. Problem solved, same with Berkeley. And why is that? The trains have doing fine at 79mph through Tukwila (Coast Starlight), Kent, Auburn, Sumner, Puyallup for years now with no issues. It will be nice when PTC is installed and intermodal (stack/container) trains increase to 70mph. Kent’s biggest issue isn’t the overpass, it is the poor timing for lights going up the hill. East/West traffic has always backed up there, regardless of Sounder or Amtrak. Lakewood has no reason to complain about 79 when Amtrak can travel through Kent in less than 1 minute. The next 2 clips shows a light power movement and an Amtrak Cascades train. I timed the Cascades train to go through every crossing in exactly 58 seconds (added 6 seconds for the gate to lower at James Street) and you can see and hear all of the other gates come down nearly the same time. I’m a huge Amtrak fan, but before we tremble about Big Bad Amtrak (irony, anyone? ), let’s try to remember its small rail footprint relative to even the most basic commuter rail like Sounder. We’re talking about 8 minutes of high-speed crossings per day. Surely we can manage that safely, and surely that’s not a burdensome imposition upon the people of Lakewood, who will also get 18 (and eventually more) Sounder trains a day in the deal. When the mid and long-range plans expand service dramatically, I can’t imagine that further crossing improvements will be excluded from those projects. Ok, now I’m heading over to the 405 to play pedestrian chicken with traffic. Whether I win or become roadkill, surely someone can be sued over the failure of the state to fully grade separate my feet from the road. Though to be fair to those wary of rail safety, the irrepressible stupidity of humanity must be admitted. The other day I rode in the front car of Sounder between Tacoma and Everett in the afternoon. We not only hit some large rocks that kids had placed on the tracks, which produced frightening sounds and a few seconds of very rough riding, but also no less than 5 people ran across the ROW in front of the train at full speed. At least they were running at full speed and not ambling along. I like how the “Neighbors for Responsible Transportation” website uses a picture of the Berlin U-Bahn in the header for their site. I guarantee that there were no public forums or public process when Berlin built the U-Bahn and the S-Bahn. Everyone marvels at the public transportation in European cities, but the methods used to construct them would never fly in this day and age of NIMBYs who expect a million dollar check every time their feelings are hurt. Not that I’m against the public process or people being fairly reimbursed for their property, but sometimes it goes a little too far. The disruption has Sound Transit and Metro talking about staging tow trucks closer to the tunnel at the International District Station, so that they could more quickly reach a disabled bus, Gray said. The truck that responded Thursday had to drive from Metro’s Atlantic base at 1555 Airport Way S. in SoDo. Just so we’re clear, take a look at this map. Why is it that Atlantic Base is “so far away”? It’s two blocks to the Royal Brougham entrance! Assuming the tow truck can travel through the tunnel (it’s gonna have to if it has to tow a bus from Westlake) you can avoid all those surface streets. Doesn’t Metro have tow truck drivers who are paid to be on-call even if they’re on-base? Maybe the truck did in fact have to go around through surface streets even though the stuck bus was southbound. Does anyone know? The scenario in which that would be the case is if some northbound Links headed into the tunnel before operations were suspended and didn’t have room to turn around at the stub, thus blocking the northbound tubes. Then a tow operator would drive around a line of buses in the two-way section from Convention Place to Westlake. Metro supervisors routinely used to use their vehicles to push a disabled coach. Also Metro used to keep a push truck stowed at CPS. The tow truck at Atlantic isn’t always available for the tunnel, as it is manned by mechanics pulled from other duties when needed, and may be in the u-dist recovering a dead trolley. After rush hour(s) Maint could recover the coach. The Coast Starlight takes approx 68 seconds to go through Kent. That is watching the gate come down, train go through, gate goes back up. The Talgo takes exactly 53 seconds for the same process. Yes, traffic will be simply “horrible” having to wait 1 minute… no different than waiting for a traffic light! Plus, I’m noting that a lot of these crossings are already separated. In Auburn, C Street was separated and then the road that goes up to Lakeland Hills in South Auburn. Actually now that I am thinking about it… out of the 30 or so planned grade separations that were planned, I believe only 8 of them have been done. These are just between Seattle and Tacoma for Sounder. I meant along I-5 where Point Defiance Bypass is. I was amazed by the comments for the TNT article about the D-M street project. Unlike past articles, most people just said let’s get on with it. Maybe ST’s new renderings had a positive effect on some of the opposition.